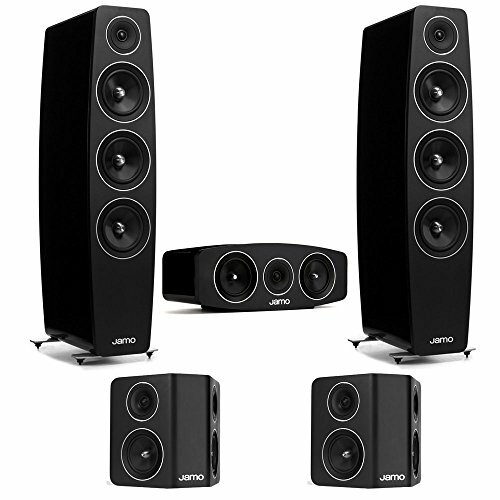 You will receive 2 Jamo C-109-HG-BLK Floorstanding Speaker, 1 Jamo C-10-CEN-HG-BLK Center Speaker, 2 Jamo C-10-SUR-BLK Surround Speaker The C 109 is a feature-packed, 3-way bass reflex floor standing speaker using two 7-inch woofers, a 7-inch midrange driver (both Hybrid Composition Conical Cones with Long Displacement Surround technology) and a 1-inch silk dome decoupled tweeter with Anti-Diffraction WaveGuide and Tweeter Distortion Reduction to deliver remarkably accurate sound. The C 10 CEN is a 2-way bass reflex center channel speaker using two 6-inch woofers and a 1-inch decoupled tweeter to deliver remarkably accurate sound. The C 10 CEN is available in High Gloss Black, High Gloss White and Walnut Veneer finishes with satin-painted MDF baffles for a premium, contemporary appearance. If you have any questions about this product by Jamo, contact us by completing and submitting the form below. If you are looking for a specif part number, please include it with your message.